“I love the lightheartedness of high camp,” says model Edie Campbell, “both for its sense of humor and its archness.” Here she wears a Stephen Jones for Giles Deacon spring 2012 avian hat and Giles Deacon fall 2013 gold woven top and skirt. 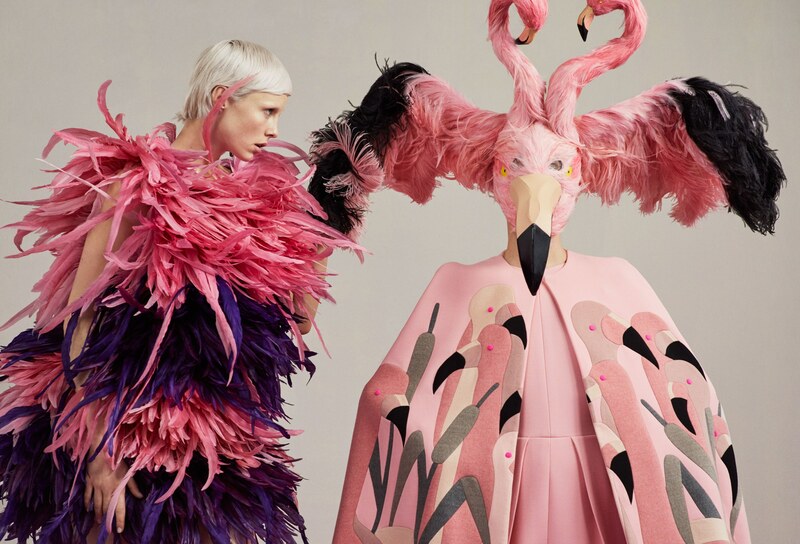 “Camp,” wrote Susan Sontag, “is a woman walking around in a dress made of three million feathers.” From left: Campbell appears cleared for takeoff in a feathered dress by Moschino, spring 2016. A flamingo-patterned cape and fantastically feathered headdress by Schiaparelli Couture, fall 2018. Campbell is the pearl emerging from Mugler’s archival couture oyster gown, fall 1995.